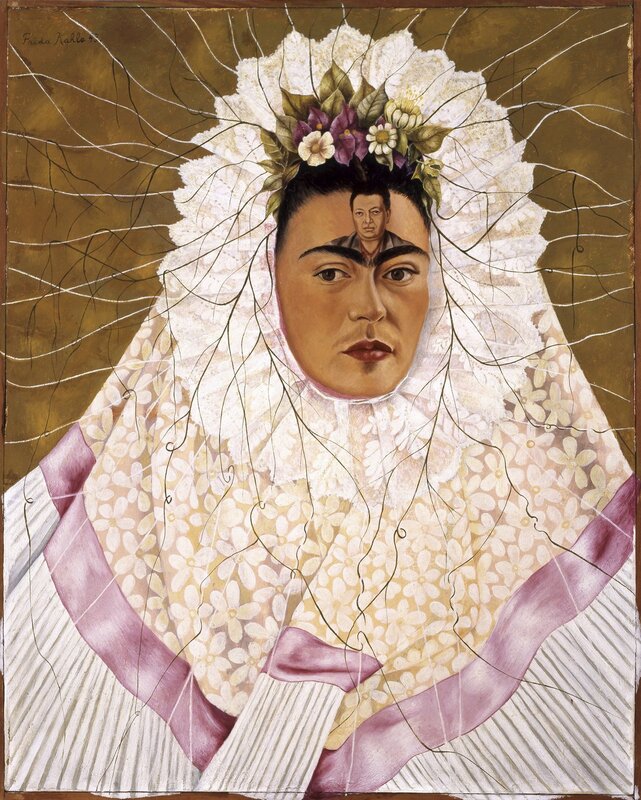 I have been wanting to feature Frida Kahlo (1907-1954) for some time now. 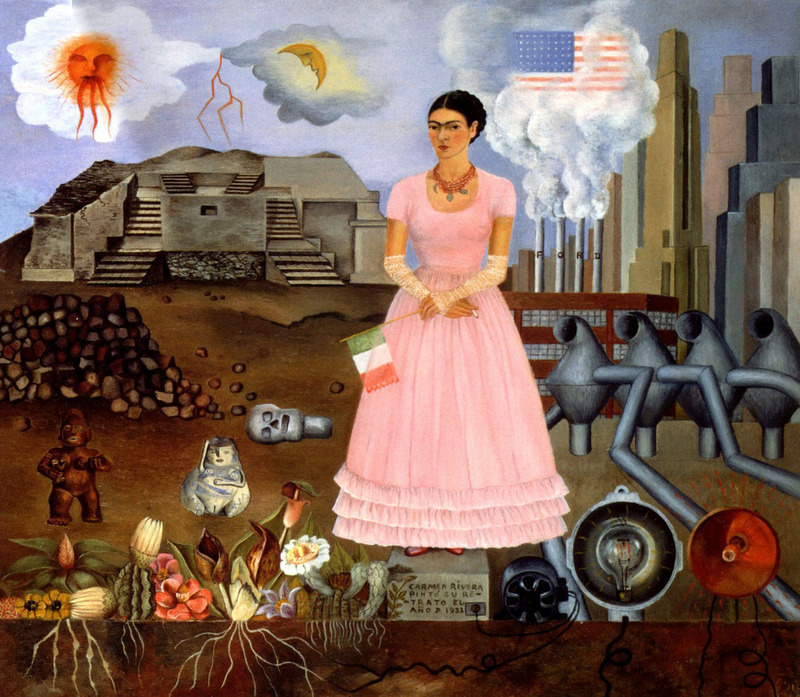 Her work is a unique and deeply personal voice in the world of art, one that touches on her identity as a Mexican, as a woman and as a political being. 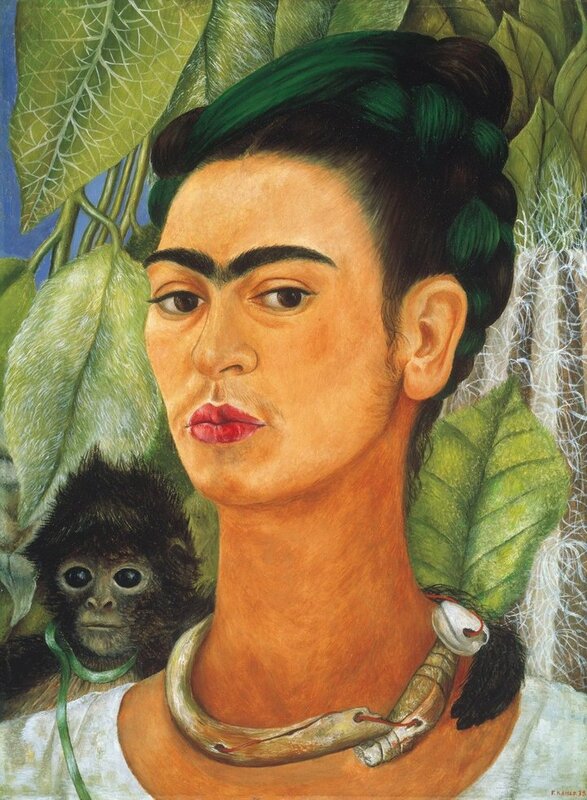 Her body of work might well be the the most overtly biographical collection done by an artist. 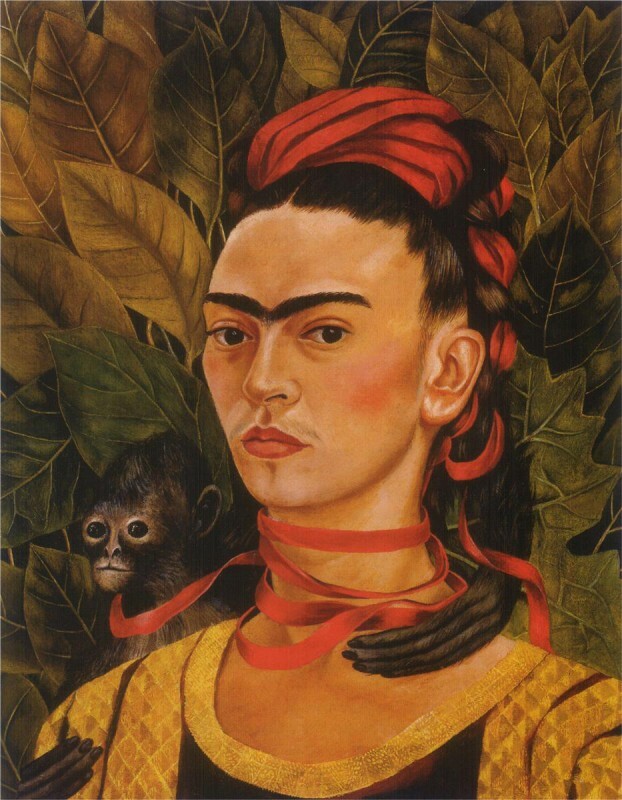 Her famed self portraits make up about a third of her output. I have no doubt that most of you have seen her work and are somewhat aware of her story. 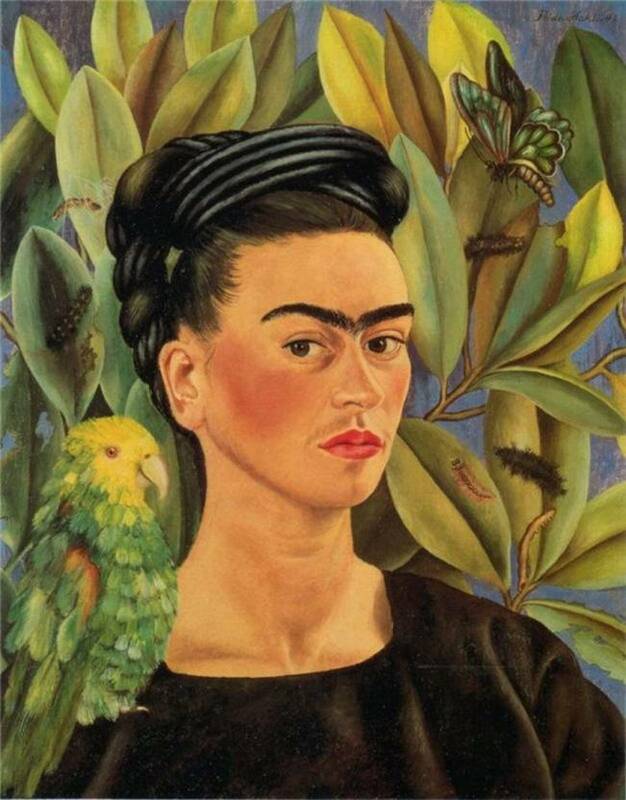 She has become an icon in modern art, the story of her all too brief life– the debilitating pain she suffered from childhood polio and a later accident, the turbulent and loving marriage to the painter Diego Rivera, her political beliefs, her affairs and much of her personal life– captured in books and film. So, I am not going to spend a lot of time on that. Instead, let’s just take a look at a few of her paintings. As I said, they are unique and deeply personal but there is something in them that appeals to aspects in many of us. There is also a short film with more of her paintings set to a song about her. As an artist I have always tried to be faithful to my vision of life, and I have frequently been in conflict with those who wanted me to paint not what I saw but what they wished me to see. 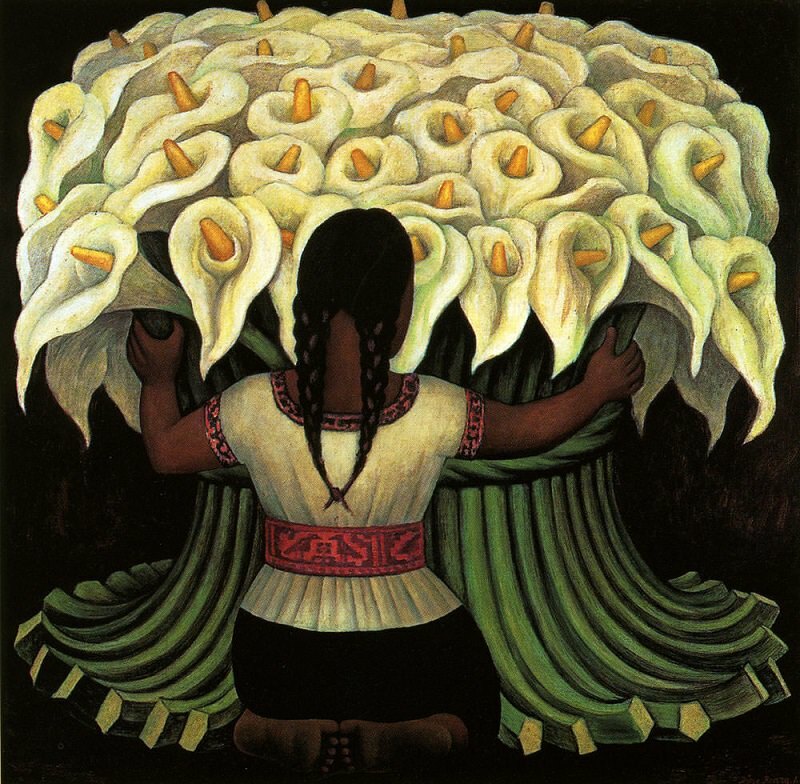 Big fan of the work of Diego Rivera (1886-1957), the great Mexican painter/muralist and husband of Frida Kahlo. There is much I love in his work such as the way his colors harmonize and soar off the surfaces, the sheer brilliance of his compositions, the scale and breadth of his murals and the fact that his work was beautiful and powerful in whatever genre or style he chose at any given moment. He was also fearless in expressing his political and philosophical beliefs in his work, often becoming a strong element in his work. I also admire his absolute devotion to his own voice in his work, as noted in the quote above. He painted his own vision, not what others desired him to see. That’s a big thing for any artist and not something easily done. Too often artists try to work for the approval of other eyes, for people who want their work to remain as they have always known it. It’s understandable from the perspective of a viewer to want an artist to remain in that space that first attracted the viewer. They know and like the work as it is and perhaps can’t imagine it becoming more than it is if it somehow evolves or changes. Or they fear it will become less or something that doesn’t speak to them in the same way. As I said, it’s understandable. But from the artist’s point of view this present a threat in that this may stop them from expanding their creative vision. They begin to be afraid to go off their own beaten path, to try new things, to move out of their comfort zone to challenge themselves, and to grow their self-created universe. They remain in a known space and may never know how expansive their vision might be if they only tried. 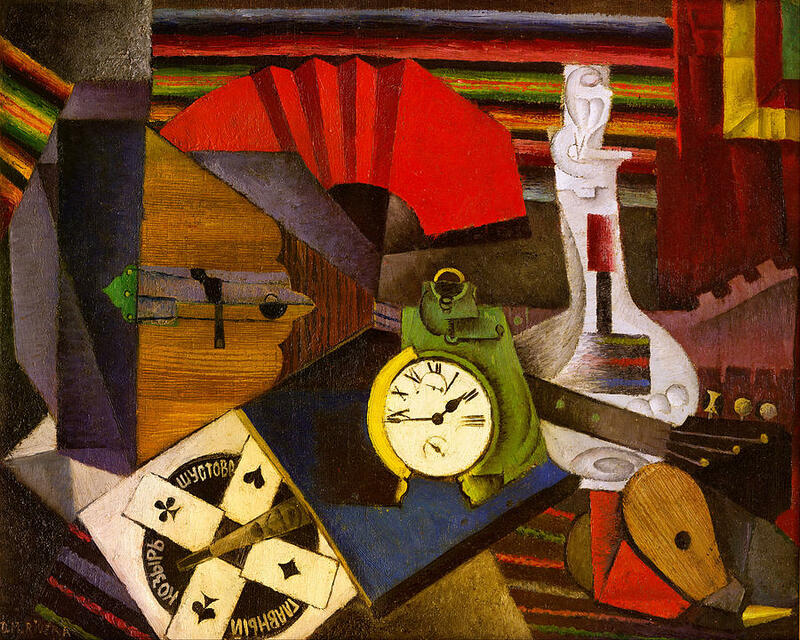 From what I know, Diego Rivera always moved to new creative spaces with his work. 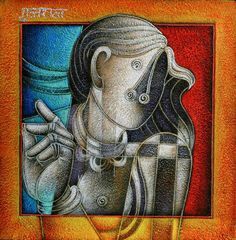 He painted with his own voice, even in his commissioned murals. I still stumble on pieces of his that surprise me. We here in the US often tend to be a little narrow in the scope in which we regard art. We often don’t take enough time or make much of an effort to seek out the art that is not purely westernized, not European or American in its origin. But there is a world of expression out there and much of it is remarkable and universal in what it has to convey to us. And, most likely, we are not aware of it. 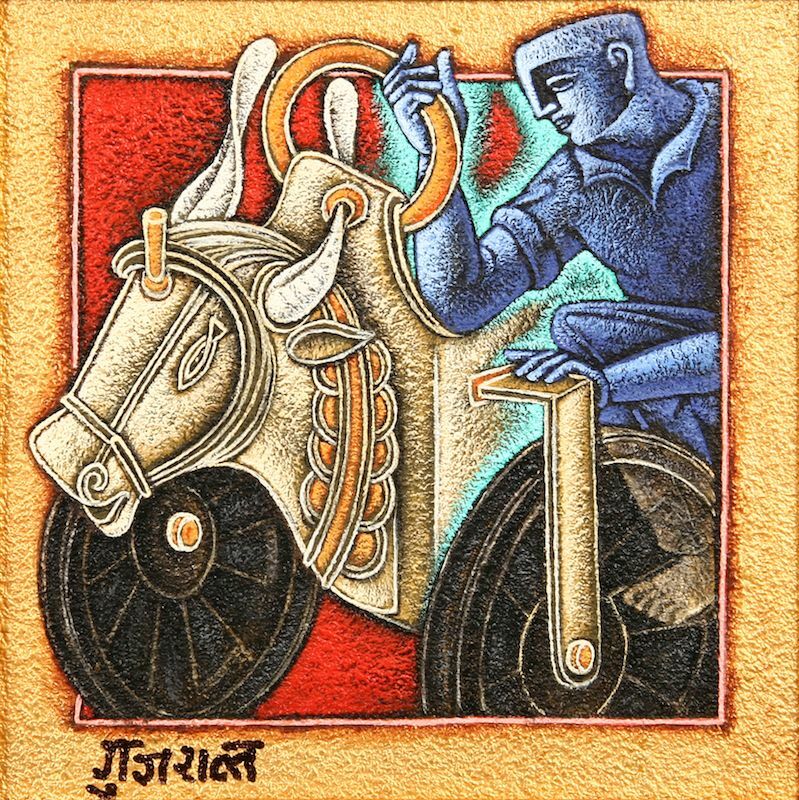 Take for instance Indian painter Satish Gujral. 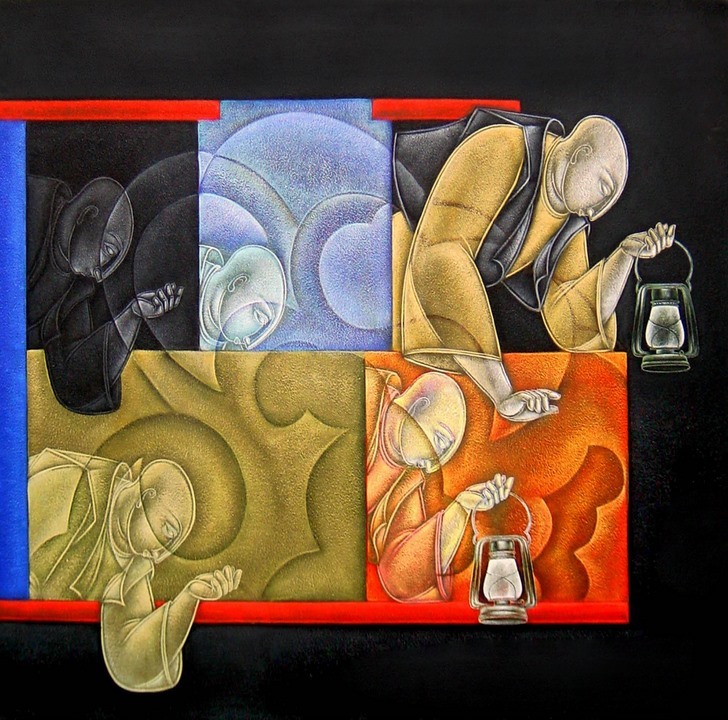 Born in 1925, Gujral is a painter, sculptor, muralist, graphic designer, writer and architect. 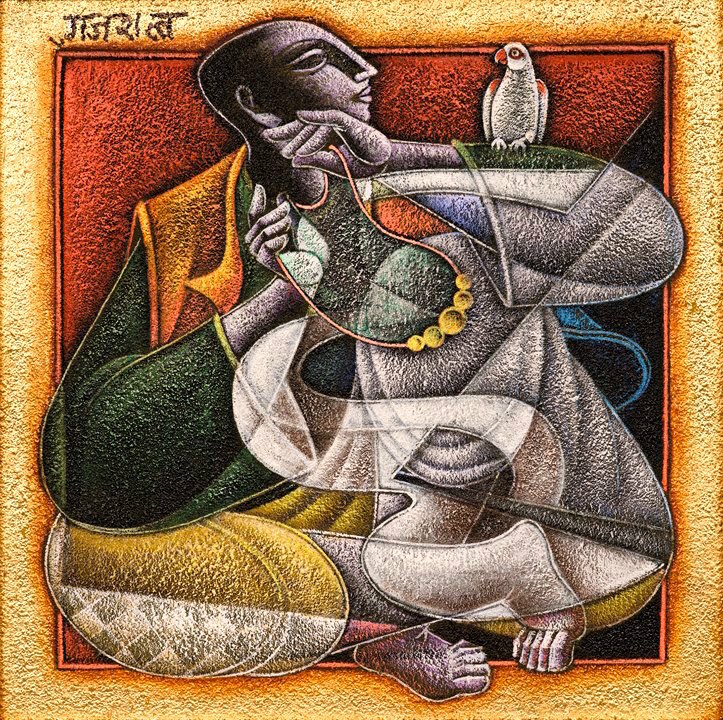 He may be India’s best known living artist. 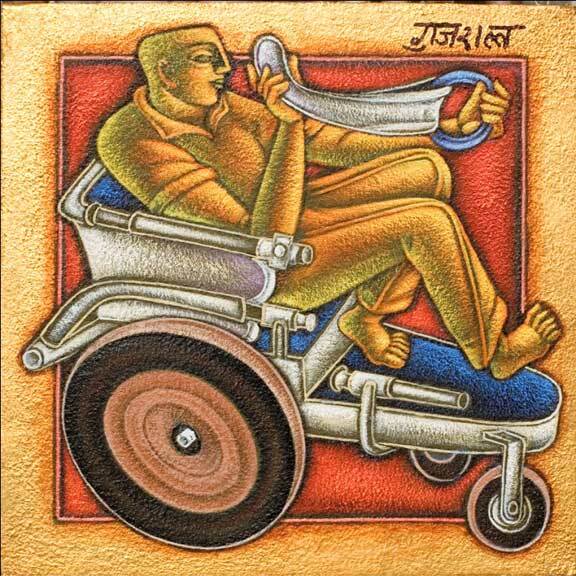 And he did it all while suffering from deafness caused by an illness at age 10. His deafness was later, at age 72, reversed by surgery. 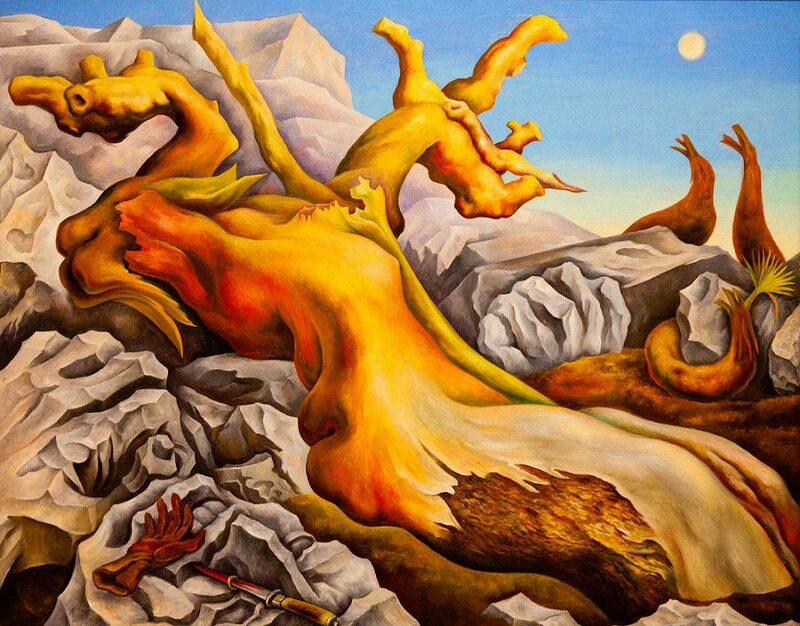 There is a lot to tell about him including him as a young man with no knowledge of English or Spanish and an inability to hear either, traveling to Mexico in the early 50’s to study with Diego Rivera. Or the fact that his brother became Prime Minister of India. Or the social commentary behind his work. I will leave finding more on the particulars of his life up to you. For me, it was the pure and broad appeal of his work that drew me in. 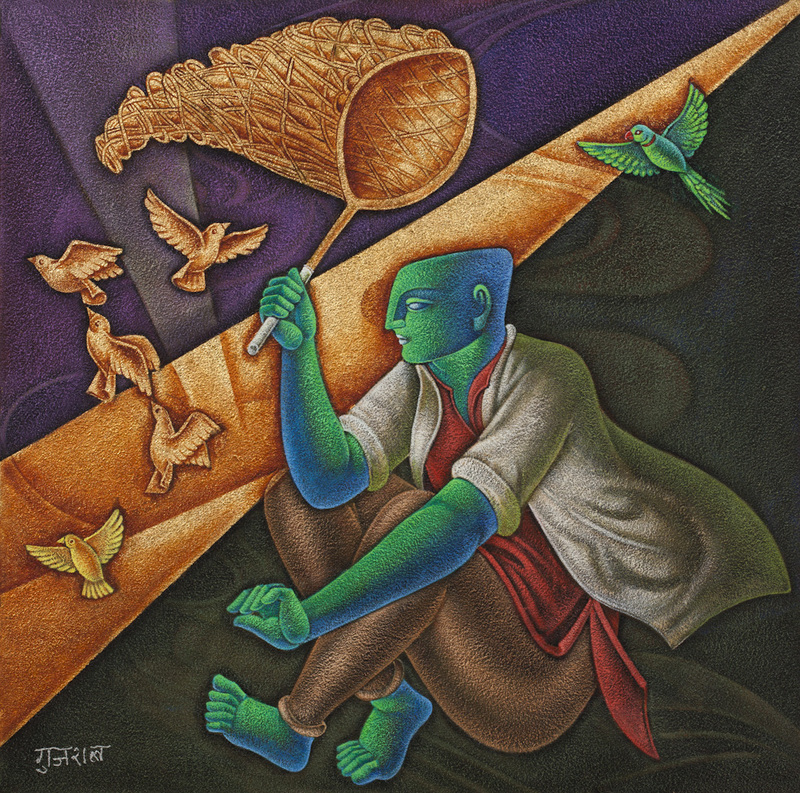 I love his imagery, his use of color and form in his paintings. He has had a long and varied career producing a large body of work in many fields but through it all, his voice is consistent– of his culture but in a universal tongue that speaks to all. Take a look at the images and video below to judge for yourself. We here in the States are often woefully ignorant of many of the artists from our neighbors in the other Americas, such as those in Canada and Mexico. Maybe I shouldn’t say “we” because I really can only speak for myself. 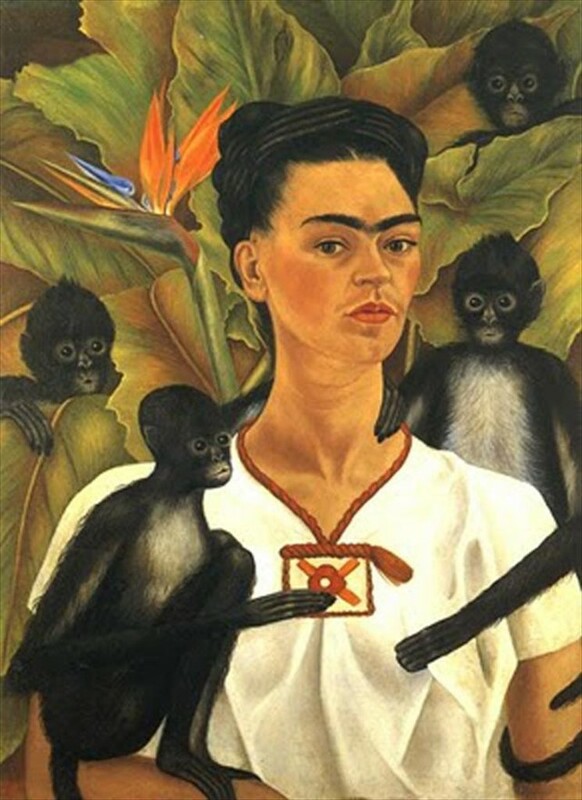 My knowledge of Mexican artists was pretty much restricted to what I knew of Diego Rivera and Frida Kahlo, both of which I admire very much. This point was driven home recently by stumbling across the work of Alfredo Ramos Martinez, who lived from 1877 until 1946. He was a painter/muralist who lived and worked in his native Mexico, Paris and California at different points in his life. He is considered to be the Father of Mexican Modernism and much of his work focuses on the portrayal of traditional Mexican people and scenes. 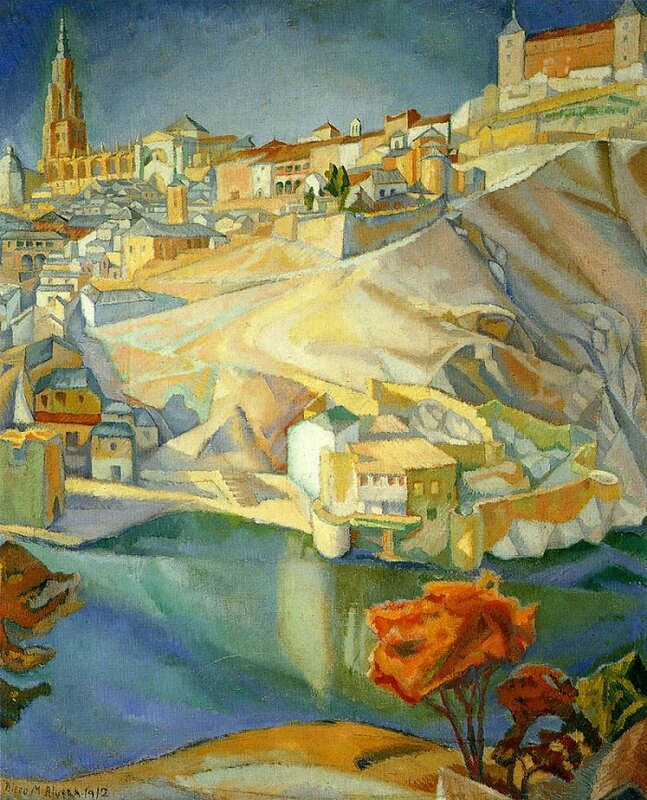 He has been described as a painter who was able to capture the melancholy and sorrow of the people and places he painted. I am not going to go into great detail about his work or life today. I am just throwing out some of his work so that if it interests you, you might look deeper into his life and work. One thing I will mention is that at the time of his death Martinez was in the midst of a large mural, The Flower Vendors, shown directly below, at Scripps College in Claremont, California. It remains unfinished but is still a striking and powerful piece of art even without its final details. Yesterday, I wrote about the mural controversy in Maine where the work depicting the history of labor was removed from a state building. It made me think of other murals and immediately brought to mind the work of Diego Rivera,who I have written briefly about here before and who was arguably the greatest muralist of recent history. 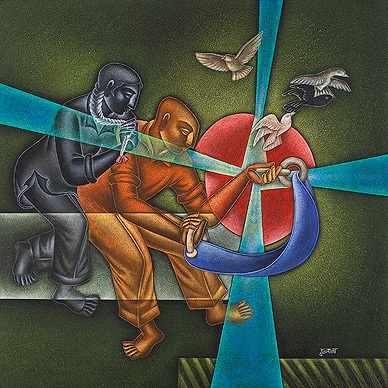 Rivera’s work often focused on the struggle of the worker. 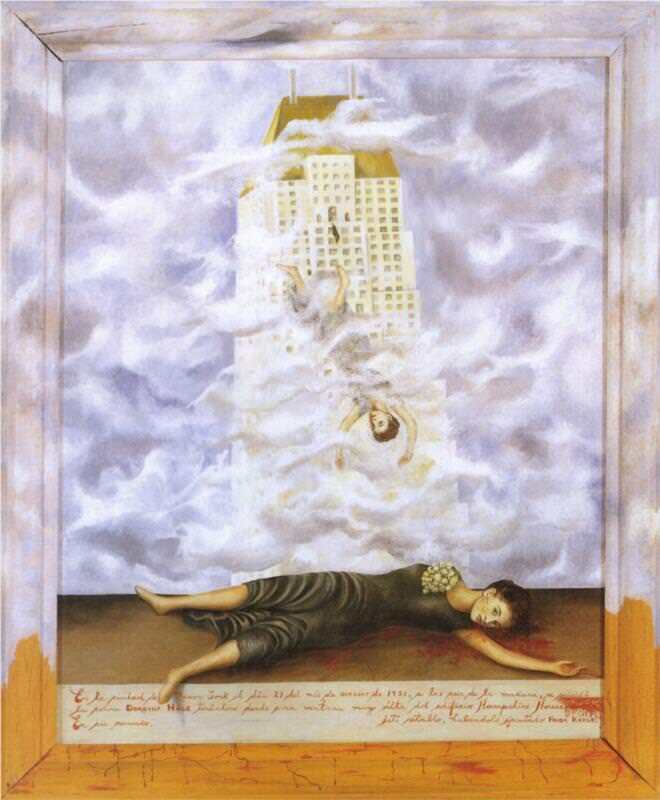 The Mexican Rivera (1886-1957) was an ardent Marxist who saw the mural as a way to to make expressive art available to the masses, away from the confines of museums and galleries which he saw as elitist. But it took money to commission his masterpieces so he was often working with those powerful forces that he often eyed with suspicion. There were episodes where the two sides bumped heads, the most famous coming when his mural at Rockefeller Plaza in NYC was destroyed because of his inclusion of Lenin in the mural and his subsequent refusal to remove it. 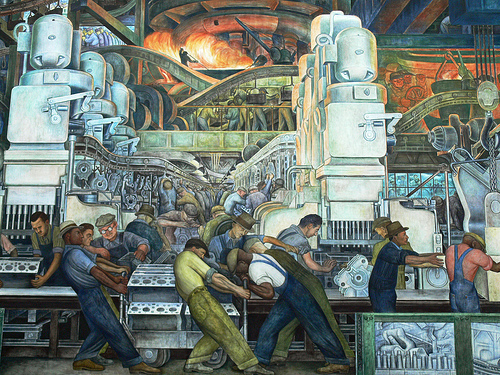 The work he considered his finest was centered around the worker and the industry of America. 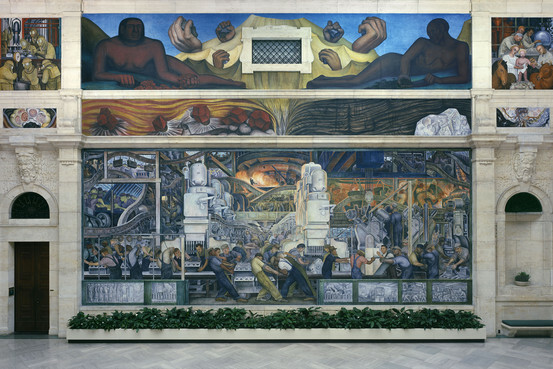 In 1932-33, Rivera painted , under the auspices of Henry Ford (who is depicted in the mural) and at the height of the Great Depression, an epic mural at the Detroit Institute of Arts. Covering more than 447 square yards, Detroit Industry is massive. 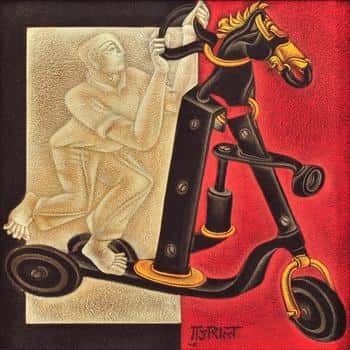 It is filled with vibrant imagery depicting the worker, in both a heroic and subservient manner, as integral cogs in the rhythmic throb of the busy industrial world. It is a feast for the eyes. I have always been drawn to Rivera’s work on a gut level, drawn in by his gorgeous color and exciting composition. When I see his grand murals I am deeply humbled and this work is no different. I am pleased that it has survived the changing tides of political favor without somebody suggesting it be painted over. If anything, it should remain if only as a reminder of the part the worker has played in building the wealth of this country at a time when the American worker is quickly overlooked by industry in favor of cheaper, unregulated labor on distant shores. 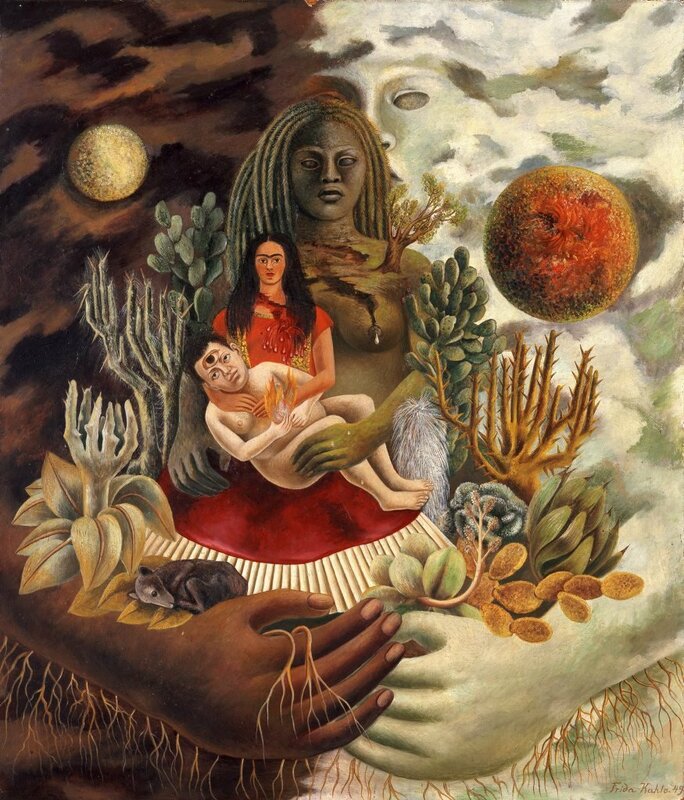 Here’s a video showing the scope of Rivera’s work. As an artist, I am both inspired and intimidated by the sheer amount of amazing work here. 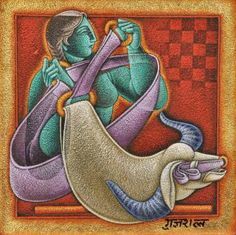 There are pieces, paintings, out there that I would love to see in person and then there are some I would rather see from a distance, if only to avoid feeling utterly humbled in my own small talent by their beauty and grandeur. 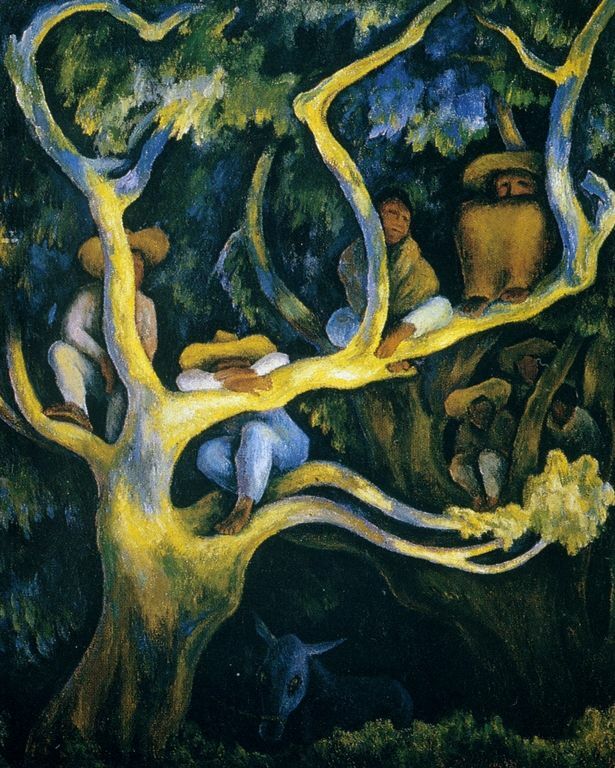 The great Mexican muralist and painter Diego Rivera created such a work. 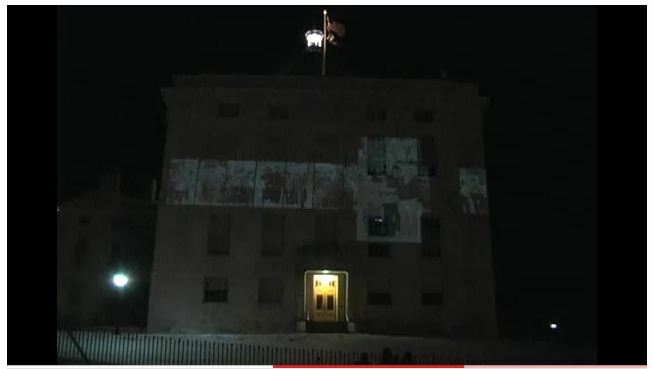 It is his Pan American Unity mural that resides at the Diego Rivera Theatre at the City College of San Francisco. Painted in 1939/40, it is a massive true fresco that measures about 22 feet tall by 73 feet long. 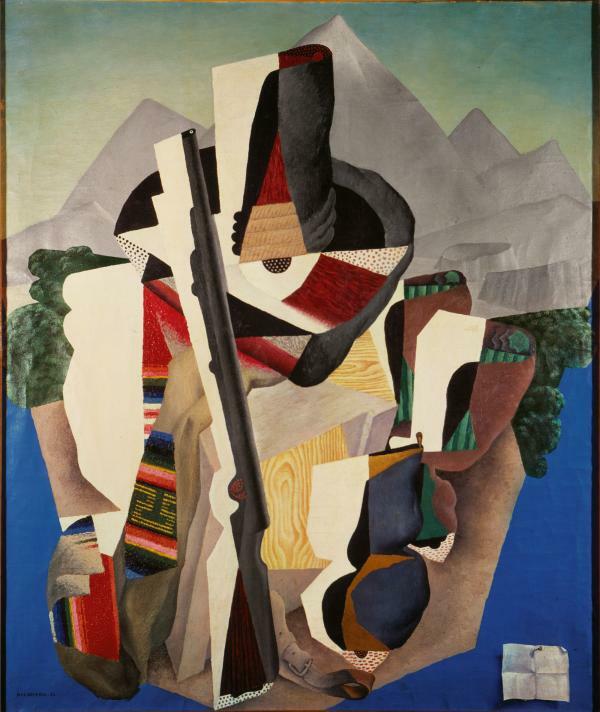 Because of time overruns in the painting of such an epic piece, much of it was painted as a public display during the Pacific Exposition of 1940. Actually, after its completion it was packed away for over twenty years, unseen, as World War II intervened then the Cold War. There was some controversy in the 1950’s over Rivera’s dalliance through the earlier parts of the century with the Communist Party in Mexico and and at that point, anything red was dead in the eyes of those in authority. So, a masterpiece sat and sat like a dormant volcano, waiting to burst into open air once more. It finally did in 1961, four years after Rivera’s death. There is a piece of silent color film from the exposition that shows Rivera at work as well as his assistants at various tasks. You can see it by clicking here. I have seen other Rivera works and never fail to feel humbled by his great talent as well as his larger than life persona. 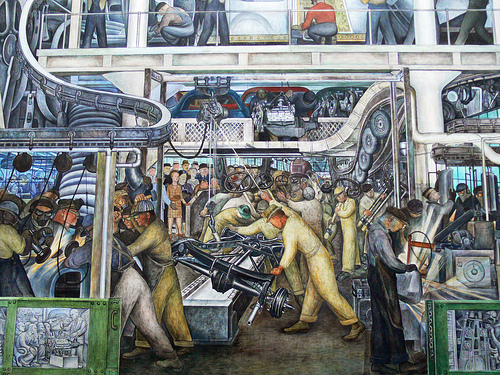 The Pan American Unity mural seems to sum up Rivera in one giant sweep, a piece so dense with imagery that one could spend months examining it and still find new details of beauty and color. It is bold and big, like the man. Epic.